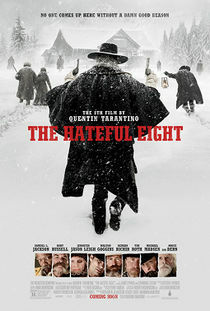 The Hateful Eight is a western by Quentin Tarantino that started production in early 2015. The project gained notoriety after an early script had been leaked and Tarantino initially shelved it. He organized a live script reading in the spring of 2014 and confirmed the project will go ahead after all, at the 2014 San Diego Comic Convention. As of June 2015 the film is in post-production. The movie was shot in Ultra Panavision 70mm, its release will be a limited release with theaters capable of that projection followed by a wider release in 35mm and DCP later. Quentin Tarantino announced in a TV appearance on Jay Leno that his next movie would be another western. Shortly afterwards, Deadline broke a story about the title and potential actors QT had approached with an early version of the script. Among the actors he approached for roles were Kurt Russell, Samuel L. Jackson, Bruce Dern, Tim Roth and Michael Madsen. On January 21 however, QT turned to Deadline to announce he will shelf the project, after he found out the script had been leaked in a too early state and he will instead turn to other projects, possibly publishing The Hateful Eight as a book. Days later, the script was spread by the gossip magazine Gawker without permission, Quentin promptly took them to court two days later. Ultimately, the case got dismissed and the issue is for now set on ice (there is an option to reopen). In April, Tarantino directed a live reading of the script in LA with a range of actors, and he announced that he was working on a revised version of the script. At San Diego Comic Con 2014, Quentin officially announced that he would be shooting the film in early 2015. The same day, the first official artwork appeared (a preview of a full page ad in Empire Magazine). On August 22nd, Robert Rodriguez' Sin City: A Dame to Kill For opened in theaters in the United States, with a teaser trailer for The Hateful Eight attached, which leaked on to YouTube within a day. In September, it was announced the film will be scheduled for a Fall 2015 release. At the end of the month, it was announced the film will be shot entirely in southwest Colorado. The first official ad for the movie (featuring a stagecoach with a trail of blood behind it) was featured in TIME MAGAZINE in July 2014. 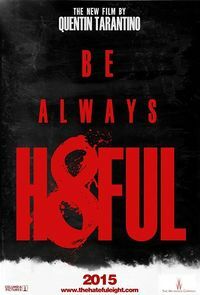 The first official teaser trailer for the film alternately titled "H8TEFUL EIGHT" was released with Robert Rodriguez's SIN CITY: A DAME TO KILL FOR (released August 22, 2014 in the US). Since nothing has been filmed yet, this preview clip is simply an illustrated introduction to the main characters with some music played over it. August 12, 2015 the first official teaser trailer was released, after the previous day had seen the release of new official character posters. This page was last edited on 6 December 2017, at 16:37.